In today’s modern society, people are more concerned than ever about the long-term consequences of utilizing harsh chemicals across a wide range of goods and services. From the toys that your children play with to the products that grace your face every morning, chemicals can be the source of much concern. As your responsible home remodeling contractors in Georgia, the Detail Design & Remodeling team focuses on delivering safe and effective outcomes for each of our clients. We specialize in cabinet refacing in Atlanta and beyond, but also provide comprehensive services to make the most out of your bathroom or kitchen renovation. Our experienced contractors can work with you to develop a personalized plan, from custom cabinets to cabinet refinishing and more. 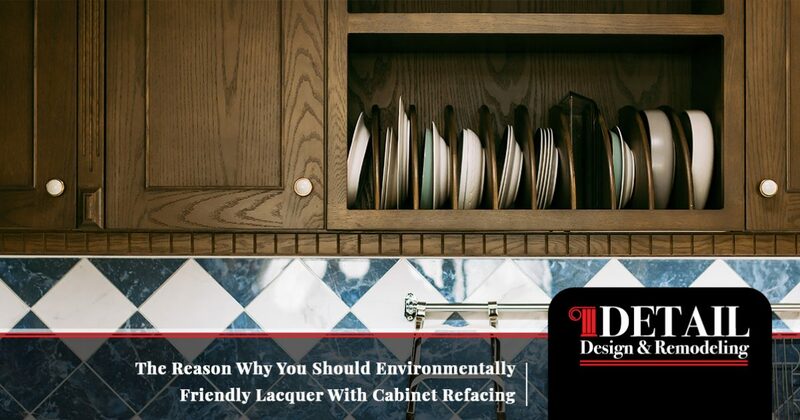 There are many reasons why we believe that our kitchen cabinet refacing services are among the best in the state. One unique reason is our commitment to environmental responsibility. Today, we’ll highlight the dangers of a common product used in home design known as formaldehyde. We’ll also highlight the benefits of our formaldehyde-free lacquer for finishing your home both safely and efficiently. Be sure to reach out to us when you are finished to learn more about our home renovation services! When you bring home a new product, such as DIY furniture, there is often a strong smell. While many people enjoy that “new product smell,” more evidence is coming out that the formaldehyde released from such products is toxic. If your home is full of new products such as furniture, cabinets, and other items that are not fully natural wood, be aware that the danger exists of formaldehyde exposure. Glues, adhesives, insulation, and more home materials are all carriers of this noxious gas. When it comes to finishing products for kitchen cabinets, the off-gassing of this hazardous chemical can put your entire family at risk. This chemical was intended for use as a preservative, leading to harmful consequences for humans. Sensitive individuals will have a much more adverse reaction, consisting of symptoms such as skin, eye, throat, and nose irritation. Increased exposure levels can lead to worse effects such as certain types of cancer. Our cabinet resurfacing team received more feedback from customers about the concern of formaldehyde in their new kitchen products. Detail Design is dedicated to providing the most effective, affordable, and safe services possible, leading us to find a new lacquer for all of our finishing services. These ratings prove that EnviroMax is built to offer healthful benefits without compromising quality. With most products, you are limited to cleaning with soap and water. Now, you can expect extreme protection for your beautifully finished kitchen cabinets! Detail Design & Remodeling is here to deliver the best outcomes for your Georgia home. Our experienced home remodeling contractors strive to provide cost-effective solutions, including cabinet refinishing and cabinet refacing in Atlanta and the surrounding areas. We also focus on environmental responsibility to ensure a healthy future for our planet. If your kitchen could benefit from a fresh look that is as safe as it is beautiful, be sure to contact us today!